What Do Authors Do? is by Eileen Christelow. You may recognize her name from the popular Five Little Monkeys picture book series. This book is written in cartoon form, and it follows two authors through the writing process, from the moment they get an idea and all the way through the arduous writing process and publishing process. Both authors get an idea when one of their pets chase the other one into a lake. The male author decides to write a chapter book, while the female author chooses to write a picture book. When I found this book, the teacher in me immediately thought, Oh my goodness! This is the perfect book to share with students as part of a writing minilesson! As an ESL teacher who co-taught in many upper elementary classrooms, I wish I had a dime for every time I reminded a student that real authors revise their writing over and over, and that as authors, they needed to be willing to revise their initial drafts, too. 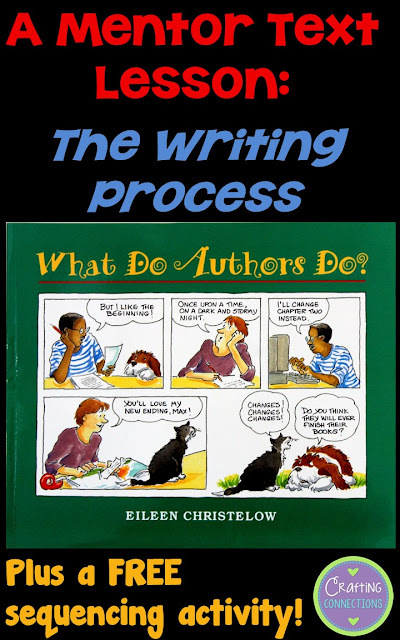 This book provides proof of the revision process for authors in a kid-friendly way. This page could serve as a springboard to make a list of things students could do when they feel stuck in writing! This is one of my favorite pages! I like how it shows that authors get emotionally attached to their writing, and that it can be difficult to hear negative feedback. Best of all, though, is how Eileen Christelow stresses that authors are persistent people... they DO NOT GIVE UP! I would encourage students to connect this to the writing process that occurs in the classroom. When the author meets with an editor, who suggests ways to make the story better, it reminds me of how students meet with teachers during a writing conference for the same reason! Another fabulous feature about this book is how it does not end when each author receives an acceptance letter from the publisher. Rather, it takes the reader through the publishing process, which includes working with editors and designers, dedicating the book, and seeing how books are printed and bound by machines. Finally, I love how the book ends... with the authors thinking about ideas for their next book. Don't you love it when you can get two uses out of ONE book? When I first read this book, I knew immediately that I wanted to use it as a writing minilesson to show students how real authors work through the writing process. However, it quickly struck me that this could serve as a dual-purpose lesson! Not only could I focus on the writing process, but I could also make this a sequencing activity! 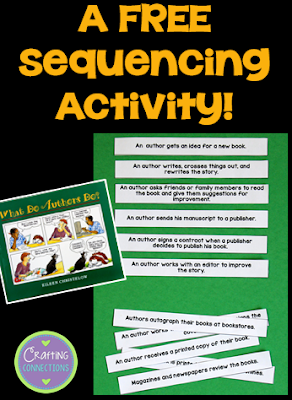 Click here or on the image below to download the FREE sequencing strips! Pin this activity for later!! I love this book. There's also an illustrator version. Thanks for the sequencing activity, too! I didn't realize that! Thanks for letting me know... I'm going to go check it out!